It is a truth universally acknowledged, that a baker in possession of a good oven, must be in want of another cupcake recipe! Of course, this one seems positively autumnal, and it is spring. But I had a special unseasonal request for my pumpkin spice cupcakes. A friend is giving an afternoon tea in a few weeks, and the guests of honor are her daughter-in-law and not yet 2-year-old granddaughter. 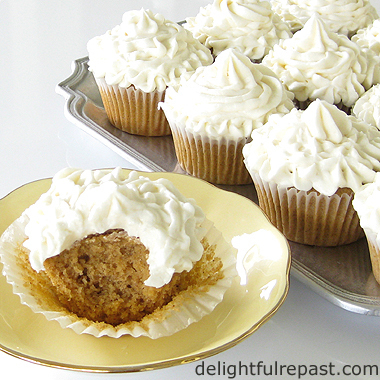 Daughter-in-law especially likes pumpkin spice cupcakes, so I'll be making another batch of these for the tea next month. I really like them with Stabilized Whipped Cream Frosting, but they will be out of the fridge for quite some time. And I happen to know that my Cream Cheese Frosting recipe can be at room temperature for extended periods of time. If it had more cream cheese and less powdered sugar, I wouldn't risk it. But I've used this ratio for decades, and it's always fine. That does not mean, however, that I'd take it to a picnic in July and let it sit in the sun for hours! These can also be made with sweet potato puree (in fact, this batch was) or butternut squash puree. Nuts and/or raisins could be added, but I was making these for someone allergic to nuts and averse to raisins. I developed the cupcake recipe to make precisely 18 standard cupcakes and the frosting recipe to make precisely enough to generously frost the 18 cupcakes. What about you? Would you make these now, or do you simply refuse to go autumnal in the spring?! * For gluten-free, use 2/3 cup sorghum flour, 2/3 cup potato starch, 1/3 cup tapioca flour and 3/4 teaspoon xanthan gum. 1 Preheat oven to 350F/180C/Gas4. Put 2½-inch paper bake cups in standard muffin tins. In small bowl, thoroughly whisk together flour, baking soda, baking powder, salt, cinnamon, ginger and cloves. Measure milk. 2 In bowl of stand mixer (or just use a 2.5-quart bowl and hand mixer), beat butter until creamy, about 30 seconds. Gradually add sugar; add vanilla extract. Beat on high speed until light and fluffy, about 3 to 4 minutes. Beat in egg. Then add pumpkin puree and beat on low speed just until blended. 3 Add the flour mixture in 3 parts, alternating with the milk in 2 parts, beating on low speed or stirring until smooth. 4 Using a 1/4-cup measure, fill the bake cups with a scant 1/4 cup of batter. Divide any leftover batter among the cups. (I developed this recipe to make precisely 18 cupcakes with no waste.) Bake for about 20 to 25 minutes or until they test done with a toothpick. 6 In bowl of stand mixer, or with a hand mixer, cream together the cream cheese, butter, vanilla extract and salt. Gradually add powdered sugar (no need to sift) and mix until thoroughly combined, adding 1 tablespoon of milk along with the powdered sugar. Beat for about 3 minutes, adding only enough milk that the frosting will be piping consistency at the end of the beating time. With a pastry bag fitted with a 2D or 1M tip, pipe frosting on cupcakes. Tut-tut…as a throwback in all things “oven,” nature has compensated me with extraordinary skills in preserving/maintaining/enhancing sugar in all forms in all venues at all times. Sun-drenched July picnic, afternoon tea, summer-autumn-winter-spring – it matters not – I will guard and taste-check all sugary concoctions at regular intervals to maintain quality control. No need to thank me. Thanks, Sully, I'll keep that in mind! Bakery/confectionery quality control--a dirty job, as they say, but I know you're up to it. They look fantastic. Since I can't get pumpkin at this time of year, not even the tin one. I will have to save this for the autumn. Angie, thanks! Well, I want to hear from you in autumn then about how they turned out for you! I adore spiced pumpkin pies but I have never tryied a recipe of such cupcakes, actually yours is the first I read, and I'm saving the link of this post of yours for this autumn, we cannot find any pumpkin in this season, alas, I'd love to, believe me, they're a blessing to me, both in salty and sweet dishes ! Dany, a reader from Germany also said that even canned pumpkin is not available there at this time of year. Hope you don't forget about it by the time autumn comes! Thank you so much. Mmmm, these sound delicious. If only I had some pumpkin to hand. It is though a truth universally acknowledged that UK supermarkets do not sell such a thing and the American shop only does so in the autumn! I will wait!! Amy, :D - You should tell the American shop people that American shops carry tinned pumpkin all year long! But I hope you will give these a try in autumn. You have such a lovely blog! I've enjoyed browsing the recipes. There are so many that look wonderful, yet they don't require all kinds of hard-to-find ingredients! - at least here in the states! 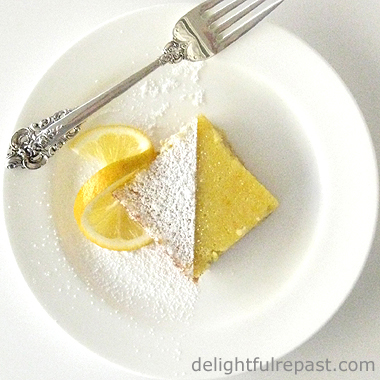 I just printed out your recipe and think this would be so good for a fall Afternoon Tea! I am planning ahead now that I have my own "tea room"! Thanks so much for sharing and linking! J, thank you so much! I like to use quality ingredients but not overly exotic ingredients. No hummingbird tongues in aspics here! Oh, Bernideen, how I envy all the people who are going to get have tea with you in your own personal tea room! I hope these cupcakes will be a hit at one of your autumn teas. Yum! I'll eat pumpkin cupcakes regardless of the season! Thanks for the visit, Jean. Thrift shopping is hit or miss with me. I can go treasure hunting for weeks and months before scoring a great deal on teacups or teapots. Looks amazing! And yes, anytime is a good time for pumpkin. I mean, I eat pumpkin curry Thai food often enough so why not cupcakes?! "It is a truth universally acknowledged," that "Pumpkin Spice Cupcakes - Cream Cheese Frosting", will win over any, "single man in possession of a good fortune." Mind you I am not single, young or in possession of a good fortune and you have won me over Jean!!! Ha! Ha! very good.Is this a new trend? I once converted the whole opening scene between Mr and Mrs Bennet into an advert for chocolate. " It is a truth universally known that a single man in possession of a bar of Cadburys Milk Chocolate...." You get the idea. You have made my day, Jean!!!!!!!!!! I've always wondered about that cream cheese frosting and leaving it at room temp. I'll use your recipe from now on. Oh my, these do look scrumptious, Jean. I love pumpkin in any season. For me, it doesn't have to be Autumn to enjoy it. Your cupcakes must taste heavenly with your whipped cream frosting on them. So many of your recipes inspire me and this one as well. Thanks so much for sharing and enjoy your weekend. Thanks, Richard. I've never had a pumpkin curry, but I'm intrigued! Margaret, thanks! I like, too, that they have less sugar than many cupcakes. Tony, I was soooo hoping you'd see this post! I knew you'd make a great reply. You have made my day as well! Thank you so much, Lea Ann. I like the flavor better, too, than those recipes with 8 ounces of cream cheese, 8 ounces of butter and 3 cups of powdered sugar. Thanks, Sandi. You know how much I love tea, so everything I bake is something that goes great with a cup of tea! I hope you have a wonderful weekend. I just happen to have a lot of pumpkin in my cupboard and these are sounding awfully good right now. I don't need autumn to love pumpkin! Wish I'd had them for our Cork Poppers gathering (I posted about our wine tasting a day or two ago) -- I would have volunteered for dessert and I would have been the hit of the day! Thanks, Jeanie! I do love a good wine gathering! The thing I like about my recipe is that it's a light, fluffy cupcake. So many pumpkin cakes are dense and heavy. I'd eat one of your pumpkin cupcakes during any season,Jean, and I'll save your recipe to try in the Fall. I'd be making it with the cream cheese frosting for sure! Kathi, thank *you*! I'll be reading more about you on *your* blog, too! Yes, it is important that we observe pumpkin season appropriately - it begins October 1, and goes till September 30. Right? LOL David, I like your attitude! Jean, pumpkin is one of my favorite cake flavors and I think it's perfect, 366 days of the year. Cocoa and Lavender expressed it wonderfully. I might even skip the frosting: the cakes look like a solo star to me. Thanks, Pauline! I'm with you on the frosting -- I just put it on for other people! The cup cakes look amazing. Thank you for sharing them at SYC! I enjoy the smell of nutmeg, cloves and cinnamon at any time of year. In the cool of a summer morning it is just as much a treat as in the autumn. Anne, thanks! Everybody loves a cupcake, right? Pondside, that's true! Sometimes I just boil up spices as an air freshener of sorts, like to get rid of bacon cooking smells. Jean you hit my weakness! I have been craving pumpkin all week. These look delicious. Thank you for sharing at #ThursdayFavoriteThings! These look delish! Thanks so much for sharing at Thursday Favorite Things Blog Hop! Congratulations! Your post was my feature pick from my Commenters at #WonderfulWednesday this week. Visit me on Tuesday evening and to see your feature! I invite you to leave more links to be shared and commented upon. Marilyn, thank you! I really enjoy it when people like my recipes. You're a wonderful hostess! Karen, thanks so much! And for adding to my list of Jeans (I know lots of middle-name Jeans!). Thanks, Choclette! Just put on one of your lovely knitted items and put the kettle on! Thank you, Ruth! Proud to have my cupcakes on your tea table -- wish I could be there! What a cupcake! And look at that glorious frosting! I love that this can handle being out for a while with no worries. Thank you, Kris! I'm really careful about food safety. Thanks, VeggieMummy! I have fun in the kitchen! :D Christine, yes it would be soooo wrong to wait! Looks good -- I don't bake any more, but I would definitely eat one of these any time of the year. Thank you, Swathi. I so appreciate it! And the pumpkin means you can have these for breakfast, too! Oh yummy! Anything with cream cheese frosting is delicious. They sure look pretty as well. Thanks for sharing them with SYC. I so need to try your version as the one I had out for tea last week did not look as good! Tandy, I hope you will! If you like a tender and fluffy pumpkin cake rather than a dense and heavy one, you should like this. Nice post. Here's a couple of points to ponder. - Allergies to nuts are not something someone can help, but "raisin-averse"? What's wrong with them,. I have heard tales of people who "don't like dried fruit in their cakes' but I always assumed this was some sort of deeply disturbed fringe dwelling cult. - In Australia, we call it butternut PUMPKIN, not butternut squash, so we don't see it as a far out concept to substitute it. - I see a lot of US "pumpkin Spice" recipes that have no pumpkin, just a range of spices that are used in pumpkin pie. This is a much better idea. - I am forwarding this to the caterer of our tea event this week as a hint. If they take the hint, I'll post pictures. Thanks so much, Devotea! I'll definitely want to see those pictures! These cupcakes pair sooooo beautifully with tea. It's morning and now I am craving a cupcake and will all day! Martie, I've often wondered the same thing! Are we kidding ourselves that they offer some sort of portion control?! Thanks, Art and Sand! I like to set off cravings! I'm not sure that seasonal flavors should be relegated only to their season. What a refreshing surprise to serve these cupcakes for teatime in spring. Good of you to color outside the lines! Thanks, Brooks! You ARE The Cake Man! Wow! I can't wait to try this amazing recipe! My two favourite things, pumpkin spice and cream cheese frosting!!! I'm so glad, LCL! I hope you try it very soon! I just had a pumpkin "whoopie pie' from a mennonite bakery and it had me craving all things pumpkin and then I saw your link over at country fair blog party and I thought yay! I can keep this pumpkin craving going a while longer!!!! THanks for sharing with us! Jan, I'm so glad! I made these for the tea party on Saturday, and they got raves! Let me know how they turn out for you.